Carpal dislocations represent a continuum of wrist injury that can lead to lunate or perilunate dislocation. The lunate cup commonly is directed in a volar direction in dislocation because of the mechanism of the injury. Perilunate dislocations result from dislocation of the distal carpal row. The capitate normally rests within the lunate cup, as seen on a lateral view. With perilunate dislocations, the capitate is seen most commonly as dorsal, but it also may be volar to the lunate on lateral x-ray evaluation. As a result of the stresses involved, scaphoid fractures often accompany perilunate dislocation. [2, 3] Carpal instability may take many forms and represents a spectrum of injury including scapholunate dissociation, lunate and perilunate dislocations, scaphoid fracture, and other intercarpal instabilities. A lunate dislocation is shown in the radiograph below. Dislocations, wrist. 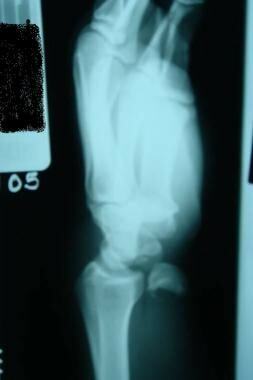 Lateral view of a lunate dislocation, with the classic teacup sign. For more information, see Medscape's Orthopaedics Resource Center. Incidence of wrist injuries is estimated as 2.5% of ED visits. Wrist dislocations represent a very small portion of these visits. Because of this small proportion of wrist dislocations, they can be easily missed on initial presentation to the ED. The morbidity of wrist dislocations is tied to the frequently missed diagnosis of lunate or perilunate dislocation in the ED. Often, patients are not diagnosed with these injuries until weeks following the initial injury. Many patients with undiagnosed wrist dislocation have chronic pain. Carpal instability, including radiocarpal instability, is a frequent complication. Avascular necrosis of the lunate, Kienbock disease, is a potential complication of lunate dislocation. Hayden SR. A case of peri-lunate dislocation. J Emerg Med. 1995 Mar-Apr. 13(2):241. [Medline]. Laporte M, Michot A, Choughri H, Abi-Chahla ML, Pelissier P. [Perilunate dislocations and fracture-dislocations of the wrist, a review of 17 cases]. Chir Main. 2012 Apr. 31(2):62-70. [Medline]. Cowell GW, Ng CY, Tiemessen CH, Phillips JE. Transscaphoid perilunate dislocation--a tale of two carpals?. BMJ Case Rep. 2011 Aug 24. 2011:[Medline]. [Full Text]. Carter PR. Fractures and dislocations of the wrist. Common Hand Injuries and Infections. 1983. 123-141. Mital RC, Beeson M. The Wrist and Forearm. Emergency Radiology. 1999. 47- 75. Rockwood CA, Jr, Green DP, Bucholz RW. Fractures and dislocations of the wrist. Fractures in Adults. Lippincott Williams & Wilkins Publishers; 1996. 745-867. Sochart DH, Birdsall PD, Paul AS. Perilunate fracture-dislocation: a continually missed injury. J Accid Emerg Med. 1996 May. 13(3):213-6. [Medline]. Perron AD, Brady WJ, Keats TE, Hersh RE. Orthopedic pitfalls in the ED: lunate and perilunate injuries. Am J Emerg Med. 2001 Mar. 19(2):157-62. [Medline]. Dislocations, wrist. Anteroposterior (AP) view of a lunate dislocation.